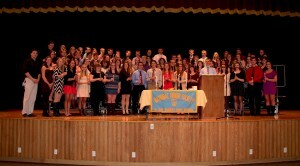 G. Ray Bodley High School in the Fulton City School District recently inducted 40 new members in the Joseph Compolieta Chapter of the National Honor Society in a ceremony held at the High School. 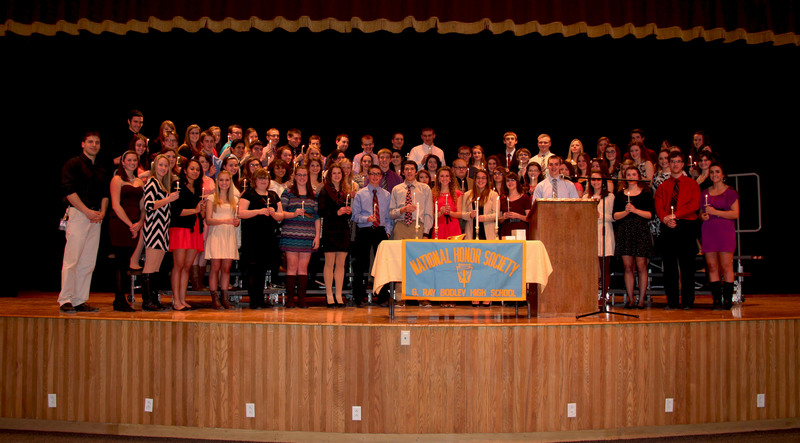 Members of the Joseph Compolieta Chapter of the National Honor Society at G. Ray Bodley High School are pictured following the induction ceremony where 40 new inductees joined the 47 senior members of the group. NHS promotes the recognition of students, juniors and/or seniors, based on four criteria: scholarship, leadership, character, and service. Scholarship is based on academic achievement and students must have an average of at least 89.5 percent to be considered for membership. In addition to academic eligibility, potential candidates should also be involved in school and/or community related activities, be responsible, dependable, resourceful, and uphold principals of morality and ethics. Students from the Women’s Choir sang the National Anthem and Alma Mater. Betsy Conners, Director of Instruction and Assessment, congratulated the inductees and wished them well on the path to their future careers. Chapter officers conducted the ceremony inducting the new members with readings on the four precepts of National Honor Society and listed the new members’ accomplishments and achievements, including their record of community service, as each new name was announced. The inductees are community minded students, having volunteered for organizations such as the Salvation Army, the Oswego County SPCA, Fulton Figure Skating Club, Locks of Love and their local churches. The 2013/2014 inductees included: Alexia Abelgore, Jacob Belcher, Robert Borrow III, Kara Bricker, Karli Bricker, Brett Campolieta, MaKenna Cealie, Kennedie Coyne, Jacob Cuyler, Amanda Deavers, Thomas Distin, Kimberly Edwards, Katelyn Ely, Abigail Field, Emma Harvey, Brian Hudson, Kylie Jacklett, Thomas Kerfien III, Angeline Kimbrell, Kaitlyn Kinney, Jennah Lamb, Alexandra LaRock, Dominique Lockwood, Makenzie Loomis, Bailey Lutz, Geoffry Michaels, Erica Pawlewicz, Jessica Race, Justina Race, Nicholas Reitz, Amanda Rice, Madden Rowlee, Jacob Seymour, Courtney Smith, Taylor Smithers, Grace Trepasso, Kendra Tryniski, Julia Velasquez, Erika Wallace and Michaela Whiteman. The new inductees joined senior members: James Bailey, Alexandra Boyce, Savannah Bray, Seth Britton, Nattalie Castellano, Amelia Coakley, Seth DeLisle, Courtney DeLong, Meriah Dishaw, MacKenzie Fanciulli, Kristyn Garrison, Sophia Giovannetti, MacKenzie Grow, Anna Guernsey, Sarah Halstead, Austin Haskins, Paige Havener, Erin Hayden, Kari Holbrook, Michael Holcomb, Jenna Hudson, Emily Hyde, Samantha Ingersoll, Jeremy Langdon, Tessa LiVoti, Julia Ludington, James Martin, Ashley McCann, Maureen McCann, Konner Myers, Matthew Nelson, Angela Paul, Keisha Pierce, Derek Prosser, Paul Reynoso, Alissa Robinson, Taylor Rose, Danielle Rupert, Anthony Semeraro, Casey Shannon, Abigail Shatrau, Tevin Simard, Noah Sorbello, Jordyn Stone, Nicholas Summerville and Mariah Whipple. This article is incorrect. The senior Alexandra Boyce is in college now, she graduated last year. I know this for a fact because i am Alexandra.